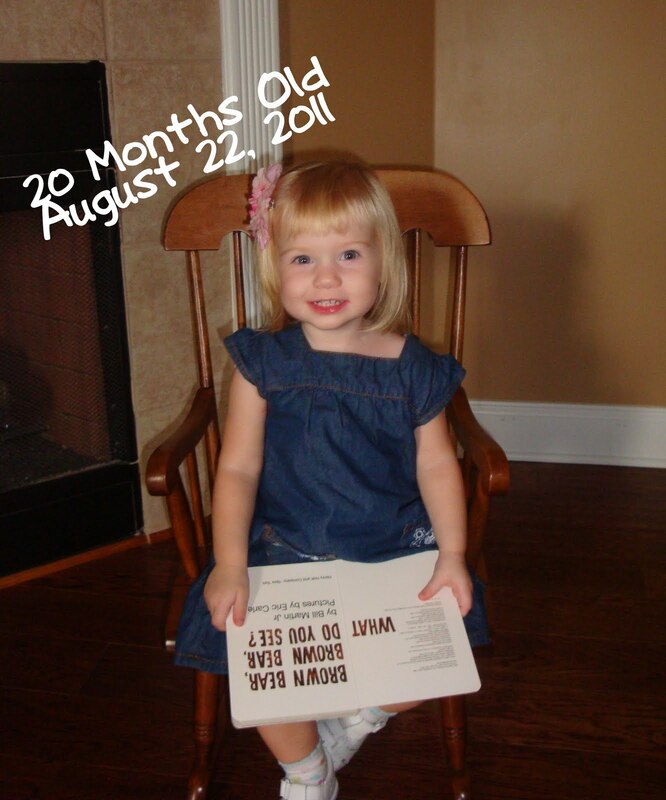 Sarah, you're now 20 months old and it seems like overnight you grew taller and more talkative. When I look at you you are starting to look less like my baby girl and more like my little girl. * You can now climb into the bathtub on your own. We discovered this the hard way. Daddy was letting your bath fill up and left you watching it while he went to grab a towel. He then heard splashing noises and hollered at you to quit playing with the water. He thought you were just leaning over the edge. He came back into the bathroom to find you fully dressed, shoes and all, sitting in the tub splashing and playing. Needless to say you don't get to watch the tub fill unattended anymore. * You still LOVE animals. Right now, horses seem to be your favorite. You have a little horse toy and a book about horses that you like to carry around and play with. * The only color you know is blue, and the only numbers you know are two and three. But you say them loud and proud. So we like to make you seem smart when you meet new people and ask you questions like "how many hands do you have". * You love to read books still. Whenever we leave the house you have to take at least one book with you but generally you exclaim "two books" and go back for another one. It's amazing when I glance a peek at you in the car. You are looking at your books like you are seriously reading them. When you get up from your naps I'll usually sit on the couch and read you a book. Once we finish it you'll run off and get another and this continues until you're ready to do something else or you've brought all your books in to the living room. * You love to be "helpful". If mommy is sweeping you want your own broom to help. If mommy is cooking, you want to help pour stuff in and stir. If Sophie needs food you want to be the one to pour the food into her bowl and then go find her and tell her to "eat, kitty, eat!". You take stuff to the trash can when asked, open the pantry, throw it away, and then close the door. * You are such a sweet girl. You've started giving spontaneous hugs and kisses. I think a few times you've said "love you" when we tell you we love you but I'm not sure. It's one of those that's still hard to understand. I think your obsession with kisses is starting to bother your dad. It's cute when you kiss us, and when you make your little people or stuff animals kiss, but the other day you tried to kiss a boy at the Y nursery. I told dad and he did not look too happy! * You have really mastered thank you recently and don't need to be prompted as much as you use to. You're pretty consistent with saying thank you when someone gives you something. Yesterday, when we were sitting on the couch drinking your morning milk you randomly turned to me and said "thank you mommy". Melt my heart. * We think your 2 year old molars are starting to move. It'll be a while before they break through the surface. You teeth early but it takes a while to cut. However, with how far back you've been shoving your fingers to chew on them and how irritable you've been we're pretty sure that's what's going on. * You've started cheering for things. It's adorable! I'll ask do you want to read a book and you'll say "Yea book!" and clap your hands. * You still have no idea that next month you'll be a big sister. We decided not to tell you. You're not old enough to understand. But we love you very much and am looking forward to you growing in that capacity.